There were several factors that seemed to weigh in on the idea that Enough Said might not be more than a film anyone would ever care to talk about, but would serve as a pleasant diversion only to end up somewhere down the road all but forgotten with its simple poster and intentionally low-key indie status. 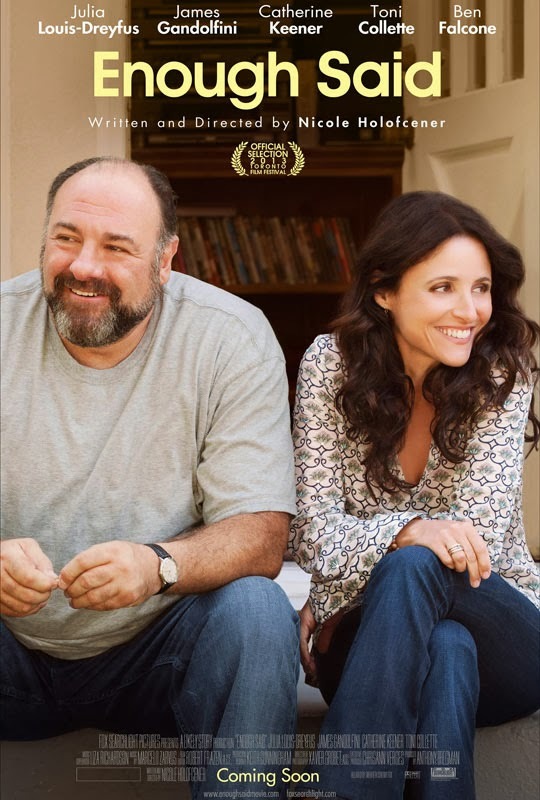 Both stars of the film, Julia Louis-Dreyfus and James Gandolfini, are well-respected names with extremely strong credentials as far as television work goes, but neither of them had ever become more than recognizable supporting characters in most of their big screen roles, though for some reason I always believed Gandolfini would grow into more of that unconventional leading man that attracted a built-in audience. All of this to say that the film took on much more weight with the passing of Gandolfini this past summer. Suddenly, this was not only one of his last movies, but his very last starring role. Upon first seeing the trailer I didn't think much as it looked to be little more than an adult romantic comedy that explored love lives after divorce and while likely intelligently written it also possessed a plot device that seemed rather hokey and something that might serve as the basis for a half-hour sitcom rather than an entire movie. What comes to be surprisingly effective about Enough Said though is that it isn't at all what you expect it to be. It doesn't play into the conventions of that otherwise despised genre that makes love look like an accessory rather than a necessity in life, but it takes on the emotion and all the baggage that comes with it in the varying relationships one has as they're passing through the middle section of their lives. This is as much about being a parent as it is a developing relationship, this is just as much about friendship and the different dynamics of every relationship as it is about a crazy coincidence that brings several different people together who share a common friend, and in some cases more than that. This is a film that subtly and comfortably approaches getting old while embracing the younger generations around it and while maybe not learning something from them, at least gaining a new experience that gives them a new perspective on life. Again, all of this to say that Enough Said is cute, often very funny, and one of the more purely enjoyable experiences I've had at the movies this year. Eva (Julia Louis-Dreyfus) enjoys a conversation with new friend Marianne (Catherine Keener). Louis-Dreyfus plays Eva, a divorced masseuse in Los Angeles who goes to a party with a few friends (Toni Collette and Ben Falcone) and winds up meeting two people that will ultimately change the course and factor very largely into her life. First she meets Marianne (Catherine Keener), a poet who lives that desirable, fluffy lifestyle that has time to wake up in the morning and run, write some over brunch and have a massage in the afternoon. She is an artsy intellectual that can be somewhat off-putting, but who Eva finds interesting and picks up as a client. At this party she also meets Albert (Gandolfini) a bit of a heavier man, but a charming guy nonetheless who its clear Eva has something of a chemistry with and so the two of them begin to date. Their relationship is as much about discovery and the honeymoon phase as any other as its necessary to still have the formalities, but neither of them disregard the fact they are older and are more than willing to discuss their lives up until the present point. They find common ground in that they both have teenage daughters whom they are getting ready to send off to college. Eva's Ellen (Tracey Fairaway) and Albert's Tess (Bono's daughter Eve Hewson) both are set to branch out on their own while they remain the only things left for Eva and Albert that allow them to really hold onto that middle-aged territory. While this more than makes for good talking points a genuine interest in one another begins to develop. We then come to find out Marianne, who has all along been telling Eva these horror stories about her ex-husband during their massage sessions, was married to Albert. Eva doesn't know what to do upon finding out and too scatterbrained to decide where to draw the line she simply allows things to keep happening developing a mentality that Marianne is like a "human trip advisor" and that if she can avoid another bad relationship, she will. Naturally, this all comes to a head, but it is the way in which writer/director Nicole Holofcener stacks this and allows it to come to light that make it such a lovely experience. It is likely important to note that I have not seen any of Holofcener's previous films, but am definitely interested in doing so now as one of the qualities that truly stands out here is the way in which the characters so naturally and effortlessly converse. It is in this dialogue and these perfectly positioned emotions behind the scenarios that Holofcener has crafted a way of writing that captures that sometimes elusive quality of comfortable conversation. She applies it in full effect here to these people who are treading new water and attempting to figure out where their life may go next. That she is also able, on top of this, to shoot the film with a seemingly relaxed eye while very intently setting up shots that elicit the heartwarming awkwardness of the situation is a testament to her subtle style that evokes reactions and emotions the audience doesn't see coming, but instead believe derive inherently from the situation. It is a real gift and Holofcener stretches that muscle multiple times here so that we come to believe in these people and this little bit of the universe they exist in. Joining in on the writer/directors mission is her sterling cast that bring the small qualities, the small facets to the characters that might otherwise be missed. Such is the case with the wonderful Louis-Dreyfus who, as Eva, isn't the most appropriate of people or the most outgoing, but she is more than content with her life, enjoys her profession and loves her daughter dearly. In coming to grips with the fact she won't have that daughter at home soon she finds it wise to give these new opportunities a shot. While her friendship with Sarah (Colette), a therapist, is fine but there is only so much you can do as a single woman who has a best friend that is married with children. These circumstances open her up to the idea of dating Albert as well as becoming friends with Marianne and we can't blame her once she figures things out because she is simply trying to avoid a potential waste of time in what she no doubt feels is limited in terms of love. Yet, as much as Louis-Dreyfus is the star here and the story is ultimately hers, the shadow of Gandolfini's death hangs over the film and his presence. What seems extremely fitting though is that this isn't another role that plays up the Tony Soprano persona, but a humble, self-deprecating, funny guy that is as sweet as he is self-respecting. That Gandolfini chose to play this type of role clearly took some shuffling out of his comfort zone, but it certainly means much more that the world was able to see him in this light, more true to his own self many have said, than to continue to think of him as someone he wasn't. As Albert, there is a subtlety to his performance, that allows us to peel back the layers and get to know him more and more with each conversation despite feeling right at home upon first meeting. Albert (James Gandolfini) is more than happy to have someone like Eva in his life. There are many things to love about Enough Said and very little to dislike at all. In fact, as I write this review and think back about the experience I was never bored nor did I have any moments where I wasn't interested or engaged by what at least some of the characters were doing or saying. I was afraid that the plot device of Albert being married to Marianne may cheapen the authenticity and credibility with which we took the characters, but despite the fact it could have very easily come off in a schticky tone, Holofcener is able to make us believe it without it being too outlandish. This is because everything else about the world Eva lives in re-enforces the reasons she is so hesitant to take a shot at a new relationship and the constant dogging from Marianne only serves as another sign for her to take caution and allow herself to indulge in all preliminary actions necessary should she decide this isn't for the best. Sarah and Will (Falcone) have a misguided relationship, her daughters best friend Chloe (Tavi Gevinson) talks to her about relationship issues that seem ridiculous given Eva likely hasn't dated in the past decade and so we take to Eva and understand her dilemma despite the fact she is probably in the wrong. On top of this we have the major layer of the daughters going off to college which pretty much splits the screen time with the romantic comedy happening between Eva and Albert. This pending departure weaves its way through every scene and brings more substance to the choices and words spoken by each while the three young actresses: Fairaway, Hewson, and Gevinson are nicely poised as strong and separate characters with their own lives who float in and out of their parents so as to inform but not be the overbearing presence these now older adults were once accustomed to and could put off bigger life decisions because of. Enough Said is a very adult comedy, a nice slice of observational humor that explores middle-aged romance while not talking down to its audience or being overly-narcissistic towards any certain group of people, but simply about people and how we love and how we hurt. A gentle film that is as re-assuring and funny as it can be heartbreaking.